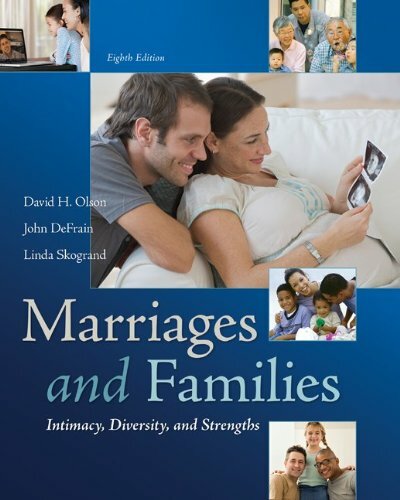 Since the first edition was published in 1994, Marriages and Families: Intimacy, Diversity, and Strengths has helped thousands of college students learn how to create and maintain enduring intimate relationships. The goal of the book has always been to integrate research, theory, and practical ideas so that people can have more healthy and productive relationships. Three distinctive themes of intimacy, marital and family strengths, and diversity are woven throughout the text. Resource Management (SAGE).John DeFrain, Ph.D., is an Extension Professor of Family and Community Development at the University of Nebraska-Lincoln, where he has been a teacher, international researcher, and outreach specialist for 34 years. He co-founded the Parent Aide Support Service, a program in Lincoln, Nebraska, which has served parents under severe stress for 25 years, and was a co-founder of the National and International Symposium on Building Family Strengths, which has cooperated in creating more than 30 family strengths conferences nationally and internationally since 1978. He has co-authored more than 60 professional articles and 24 books, including Secrets of Strong Families (Little, Brown); Marriages and Families: Intimacy, Diversity, and Strengths , 6th Edition (McGraw-Hill); and Strong Families Around the World: Strengths-Based Research and Practice (Haworth). the Latino population. She has also taught family courses at St. Olaf College in Northfield, Minnesota, for 17 years and was adjunct faculty at the University of Minnesota for several years.She has published articles focusing on values in parent education, the lives of families who have experienced Sudden Infant Death Syndrome, transcendence of traumatic childhoods, spirituality, strong Latino marriages, and debt and marriage. She has co-authored several books including Surviving and Transcending a Traumatic Childhood: The Dark Thread, Coping with Sudden Infant Death, and Sudden Infant Death: Enduring the Loss. . Her current research focuses on strong marriages in the Latino and American Indian cultures and she is currently conducting a national study of what makes “great” marriages with John DeFrain.Skogrand has been married to her high school sweetheart, Steven Gilbertson, for the past seven years and resides in Logan, Utah. She has three adult children, Aaron, Jennifer, and Sara. Her children’s multiracial heritage has taught her much about diversity.